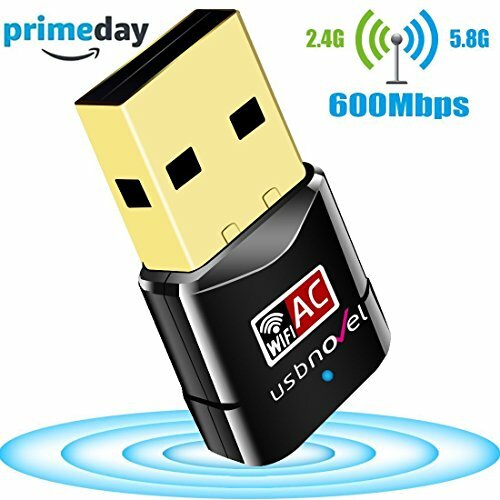 USBNOVEL Wifi Dongle AC600 Dual Band ( 5GHz 433Mbps or 2.4GHz 150Mbps ). Wireless USB Wifi Adapter for PC / Desktop / Laptop / Tablet, supports Windows 10/8/7/Vista /XP/2000, Mac OS X 10.4 - 10.12.2 ( No drivers required for Windows 10 ) 5GHz at 433Mbps is perfect for HD video streaming and gaming, while 2.4GHz at 150Mbps is enough for web surfing and online chatting. Shift between two bands, you have optional wifi internet connection for your pc, desktop, laptop, or tablet.Warm Tips: 1. Please install the driver at first , you can find the driver installation file from CD, then you can plug your usb wifi adapter into your device.2. This Wifi Dongle has two bands, but it can run at up to 433 Mbps speed only when connected with router which support 5 GHz band and its min speed is at least 433 Mbps and up to 150 Mbps speed when connect with router which support 2.4 GHz and its min speed is at least 150Mbps.3. This usb wifi adapter can only receive network signals, but can not strengthen it, if you want to get strengthen function, then you choose a wifi booster.4. 5 Ghz mode stands out within short range. If your router is close to wireless network card , then wifi signal will be stronger under 5 GHz than 2.4 GHz . If the distance is longer or there are many obstacles between usb wifi adapter and router, then you will get a better signal under 2.4 GHz.Package Includeds: 1 x AC600 Wifi Adapter 1 x CD with driver and E-User Manual1 x Quick Installation GuideCustomer Service SupportDriver Download link: http://bit.ly/2qLS37h- 12 Months Worry-Free Warranty.- 12 hour customer respond service and contact with us at support@usbnovel.com at any time you want.- 100% Customer Satisfaction. Innovative mini dual band wireless adapter, the newest and most powerful wifi technology - 3 times faster than wireless N speeds. Dual band reduces interference for better connections to more wireless networking. Support for win 10 / 8 / 7 / XP / Vista ( 32-bit/64-bit ) and Mac OS X 10.4 ~ 10.14: Plug-and-Play for win 10; for other type operation system, you need to install the driver with the included Set-up CD, and simple plug the our USBNOVEL wireless USB wifi adapter into your device once the drive is correctly installed. ( Download Newest driver link from http://bit.ly/2qLS37h or http://www.usbnovel.com/downloads-729c1.html or Contact us ).